The bill that allows for the introduction of abortion services in Ireland has passed all stages of the Oireachtas and will now go to President Michael D Higgins to be signed into law. The passing of the Regulation of Termination of Pregnancy Bill follows more than two months of consideration by TDs and Senators. 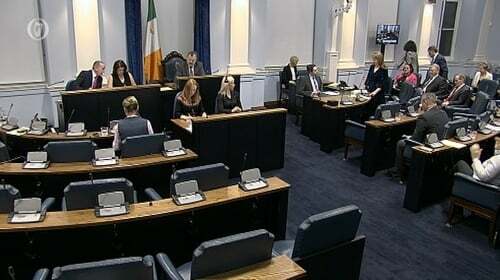 The report and final stages of the bill passed in the Seanad tonight following nine hours of debate. The first speaker following the passing of the bill was the Fine Gael Senator Catherine Noone, who was Chairperson of the Oireachtas Eighth Amendment Committee. Senator Noone said her thoughts were with Savita Halappanavar. She also said a debt of gratitude was owed to the former taoiseach Enda Kenny for the setting up the Citizens' Assembly on the issue, the current Taoiseach Leo Varadkar for putting the issue front and centre and the Minister for Health Simon Harris. Senator Noone said she has had a lot of negative comments come her way in the last year, but she was proud to be involved in such monumental change. Independent Senator Rónán Mullen described the passing of the bill as a sad moment. He said that Ireland had not so much caught up with the rest of the world, but had lost its lead. The senator said that something noble, good and productive had been lost. He thanked "the visionary people" who established the Eighth Amendment in 1983. "Once more we will see stirrings of idealism and a new generation will return and will demand a return to solidarity," he said. Ireland voted decisively to change the Constitution to repeal the Eighth Amendment in May, with 66.4% voting in favour of new legislation to allow for the termination of pregnancies. Minister Harris said: "This is a genuinely historic moment. It paves the way for the implementation of the service for termination of pregnancy in January 2019. "The legislation permits terminations to be carried out up to 12 weeks of pregnancy; or where there is a risk to the life, or of serious harm to the health, of the pregnant woman; or where there is a risk to the life, or of serious harm to the health, of the pregnant woman in an emergency; or where there is a condition present which is likely to lead to the death of the foetus either before or within 28 days of birth. "I want to thank the campaigners who fought for 35 years to change a nation, to change hearts and minds. I want to thank the minority who fought the battle in here when it was convenient for the majority to ignore. "But today, I think mostly of the thousands of women who were forced to make the journey to access care that should have been available in their own country." Speaking on RTÉ's Drivetime earlier, Senator Noone said she expected the legislation to reach President Michael D Higgins' desk "very, very soon". She said she would not accept claims that the bill has been rushed through the Dáil and Seanad. Ms Noone said there was a very lengthy debate on abortion prior to the May referendum, and people were "very much aware" of the heads of the bill when they voted. She added there has since been "extensive debate" in Leinster House. "To say it has been rushed is not a reality. We have debated and debated and debated this," she said.